Mario came to us when we were attending the 2018 VO Atlanta conference as vendors. 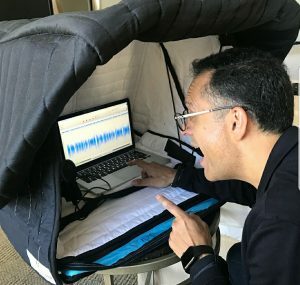 He was interested in our carry-on vocal booth, the VOMO, recommended by his college who already owned one. After talking with us about it, he purchased one and loves it! He posted many pictures on social media stating his affection for it and how he can use it anywhere to record his voice over sessions. Mario is the voice for many popular Disney characters in Spanish language in Mexico. Some of his characters are Miss Piggy, Wreck-It Ralph, Goofy, Obi Wan Kenobi and Beverly Hills Chihuahua just to name a few. 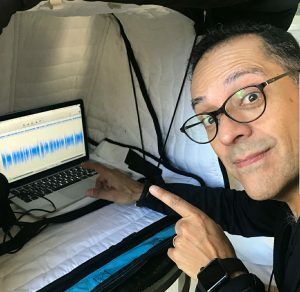 As you can see from the pictures, Mario loves his VOMO and puts his laptop inside the booth with a mic attached to a small microphone stand. 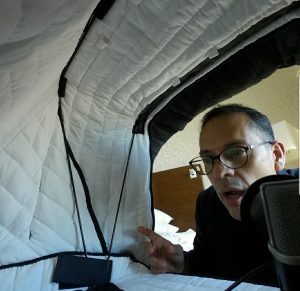 There are many ways to use the VOMO and is a very flexible tool for voice over actors. Mario Gómez Herrera better known as Mario Filio (born on March 13, 1966 in Mexico D.F.) is a Mexican voiceover actor and voice actor. Recognized for being the official voice of Obi-Wan Kenobi from Star Wars episode II: Attack of the clones, dubbing him in all his official appearances, as in The Revenge of the Sith, Clone Wars and The War of the Clones; He is also known as the voice of King Julien of Madagascar, Miss Piggy in the Muppets movies, Nico in the Rio films, Jaimico in the animated series Soy la Comadreja and the Argentine monster in Monsters, Inc .
At the moment he is the official voice of Goofy, doubling it from the club of the villains with Mickey and his friends, and also Rabbit, personage of Winnie the Pooh. Mario is also the voice of the Deadshot character in the DC Films Universe. Coming from one of the most recognized families in the Mexican art scene, his father better known as “Tilín, the voice photographer” is considered one of the best actors and comedians of the Mexican gold film era. While his brothers Alejandro Filio, César Filio, David Filio, Mariana Filio and Gabriel Filio and their nephews Iván Filio and Paolo Filio have been involved, to a greater or lesser extent, in activities related to the artistic world, dubbing, advertising and mass media Communication. ANDI, AFTRA and SAG. During this time he has developed as an announcer, singer, dubbing actor, comedian, image for commercial commercials of television and corporate videos, conductor of radio and television programs, special events, commercial and radio producer. Throughout his career, he has lent his voice to national advertising campaigns, giving life to spots, commercials of brands and products in the Mexican market such as Comercial Mexicana, Six Flags, Mattel, Telcel, Radio Shack, Gillette, Bimbo , Channel 11, Coca Cola, Kelloggs, Microsoft, Panda Show International, Alpura, M & M’s, Barcel and Luz y Fuerza del Centro. In addition, he performed the song entitled “The Friends of the Goal” which was the official anthem of Cruz-Azul during the decade of the 80s and the first half of the 90s.